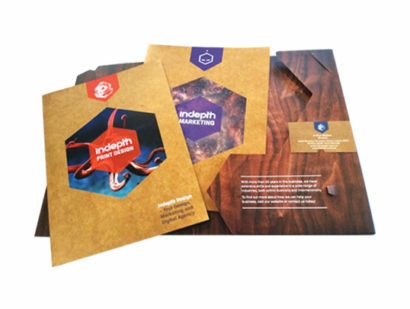 At Indepth Design, we’re all about crafting custom-designed marketing materials to persuasively spread the word about your unique service or product – simply and with no fuss. Across our 25 years in the game, we’ve learned that hard-copy marketing is still a powerful marketing tool to promote your business and convert viewers into custom. View our folder for an example of how you can reach new markets and increase your brand potential with an effective, polished solution. 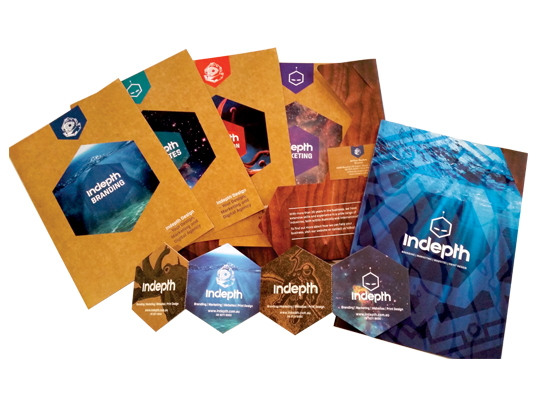 A great presentation folder, including a business card, corporate profile, capability statement and product brochure is a highly compelling sales tool. It also serves as a durable corporate asset. Make sure yours is strategically designed and written so the finished product results in an advertising and marketing investment. Like to find out more? We’ve negotiated with our suppliers to put together the below packages at the most affordable rates. We can also put together the words to ensure you’re credibly conveying your business in the most convincing way. Got an idea for your new branding? Simply submit a request form and we’ll be in touch in a heartbeat. Alternatively, if you require more guidance, pick up the phone today and speak directly with the team that will deliver your new image, the way you want it.